Project Junebug can be advanced. If you pay 1credit when the Runner accesses Project Junebug, do 2 net damage for each advancement token on Project Junebug. The advantage of using Project Junebug, over other ambushes such as Cerebral Overwriter and even Snare!, is the fact that it takes a solitary credit to fire it's ability. For the same amount of credits it takes to use Snare!, Project Junebug will cause double the net damage, enough to flatline a fully gripped runner. In metas seeing heavy Account Siphon and/or Vamp usage, and where the Runner won't run on remotes until the Corp has no credits, there nothing more frustrating the carefully laying out several traps only to not have the credits to use them. However, install Project Junebug behind a Pop-up Window and it doesn't matter that the Runner just Vamped your credits away. It is this low cost to potentially high damage that helps makes Project Junebug as dangerous as it is. As Jinteki’s primary advanceable trap, Junebug has seen a lot of use. The greatest aspect of Junebug’s existence is the shell game that is played primarily within Jinteki. 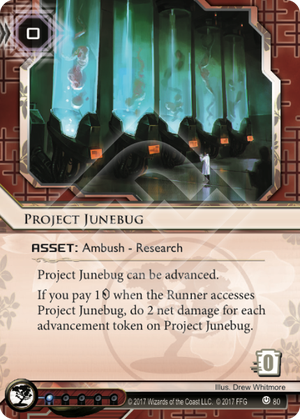 Any card that has been installed and advanced twice (IAA, or Install Advance Advance) is simultaneously both a possible Junebug and an agenda that might be scored next turn. It becomes very dangerous for the runner - do they run such cards and risk a massive amount of net damage, possibly enough to kill them, or do they ignore it and let the corp score an agenda? That dilemma is at the core of the Jinteki playstyle philosophy, forcing runners into difficult decisions and capitalizing on their actions therein. Junebug falls into and out of popularity, often being replaced or supplemented with a Cerebral Overwriter. Junebug’s status entirely depends on the type of shell game that the Jinkteki player wants to play, does the corp want to tempt the runner with IAA cards in servers, or make them sweat with a bunch of unrezzed unadvanced cards, such as Snare!. However, its mere existence forces a knowledgeable runner to be wary of the possibility that any IAA card is a Junebug waiting to strike. That alone means it carries weight into the future of the game, even if it does not see active play.